Wenatchee nicknamed “The Apple Capital of the World” is located in Chelan County, WA along the Columbia River. Wenatchee WA is a recreational paradise with incredible Columbia River properties, and beautiful Cascade Range Mountains. Boundaries of Wenatchee are Squilchuck including Forest Ridge and up to Mission Ridge Ski Resort to the South, West up Number 1 and Number 2 canyons , East boundary Columbia River and North Sunnyslope homes and northern Columbia River waterfront properties. Wenatchee real estate areas of interest include South Wenatchee homes, Historical Downtown Wenatchee homes, Forest Ridge Homes, Sunnyslope homes, North Wenatchee homes, Columbia River homes, Broadview Wenatchee homes and other popular areas. The Nick McLean Real Estate Group has a market center with local experts and professionals to serve all your Wenatchee Real Estate needs. 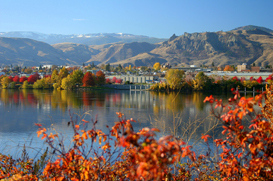 AARP named Wenatchee one of the best places to live in 2011! Wenatchee 2011 Median Housing Price $192,000.